Things I have learned from Santa Claus! Generally speaking, I am a glass is half full person and so when I saw this HuffPost about Santa it was right up my alley. My outlook on life makes my life as a mom, nurse and social worker a good choice for me because I am able to see a silver lining in almost any situation. It is a gift which was blessed upon me and nurtured by my grandmother throughout my young life and very early adulthood. In my work, it is easy to see people, who do not have the qualities that Santa Claus has which keep him going year after year bringing joy and happiness to others. He does not do his work alone…he has a strong social support and lives in a long-term committed relationship. He gives of himself and his generosity contributes to his happiness. His lifestyle is a balance of work and play. But after all no one is perfect! via What Santa Claus Can Teach The Rest Of Us About Living Well. He knows the value of generosity. He doesn’t have a sitting job. Santa has a strong work ethic. But his work-life balance is great, too. * My choices for the most important qualities that influence a person’s life and happiness. 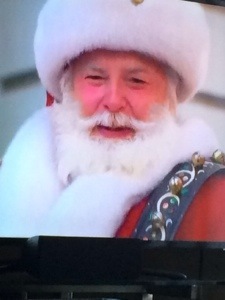 This entry was posted in Family and tagged Santa Claus by llpitlwp. Bookmark the permalink.